When and how lawn cutting is done is very important in the development of healthy turf. Another important factor is consistency. In order to maintain the health of your lawn, the BUR-HAN team visits your property on the same day each week. 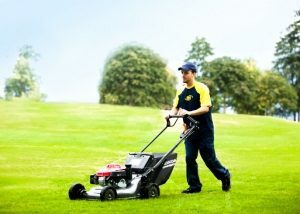 The lawn will be cut at a height of 2.5 to 3 inches to help develop the plants root system and produce a thicker turf. If your lawn has not grown more than .25 inches we will skip your cut at no charge until the following week. We take part in and support the use of the recycling of the grass removed from your turf and will place the waste in the receptacle provided by your municipality. Every time that we come to cut your lawn we will also edge the lawn and blow clean any grass that may have sprayed onto walkways to keep your lawn and garden neat and tidy. To learn more about our weekly North Vancouver lawn mowing service, please complete the free quote form below and one of our friendly customer service representatives will contact you right away.